Address: 1081 Budapest, Kenyérmezö u 4. The hotel has 49 rooms. Hotel Bristol is located in the business area of the capital of Hungary and simultaneously in close neighborhood with numerous sights of the city, next to Keleti Railway Station. Airport: 26 km km >> Order your transfer! Three Corners Hotel Bristol is situated in downtown Budapest, in a central location of the business quarter of the capital, near the International Eastern (Keleti) Railway Station and The Central Avenue of Budapest (Rákóczi Street). 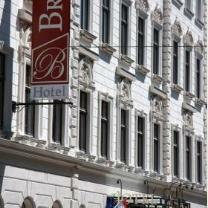 Three Corners Hotel Bristol is very well located for sightseeing the best of Budapest. Three Corners Hotel Bristol offers the most outstanding services for tourists and business travellers who love the boutique style. Our guests stay in comfortable, well-equipped and spacious rooms in a modern 4star stylish environment. The atmosphere of Three Corners Hotel Bristol is ideal for meetings, trainings, company and family events. The hotel awaits its guests with a total of 49 designer rooms -. There are different room categories to satisfy the demands of all business and pleasure guests who wish to spend their holiday with us. There are 18 double bed and 31 twin bed bedrooms. Among our standard category rooms there are 2 intercommunicating family rooms which provide comfortable accommodation for families. Both for our smoking and non smoking guests, we have rooms arranged for their convenience. Our larger superior rooms have twin beds. Some superior rooms have their own balconies. These rooms face the quiet Atrium court. The large room equipped with handholds situated on the ground floor guarantees the comfort of our disabled guests. The hotel is obstacle free, so the guests have comfortable access to the room and public areas.